The aurelia team provides starter projects that they call skeletons that you can download and get up and running really quickly. However when I tried using them, the skeletons seemed to have issues which were both time-consuming and frustrating to resolve. Even the skeleton that was supposed to run with .NET MVC (and had a “.sln” solution file) would not even compile without errors. And these skeletons come with a lot more than what you would like have when you are just trying to get an initial hold of Aurelia and type-script. This left me with no other options but to star fresh and create my own basic skeleton where I can try out different Aurelia features. If you’ve tried to get started with Aurelia + Typescript and you are a .NET programmer who lives inside Visual Studio, the goal of this post is to get you up and running with Aurelia and Typescript inside Visual Studio 2015. To being with you’re going to need Typescript working inside your Visual Studio 2015. The simplest way I’ve found to do this is, just un-install older versions of Visual Studio 2015 and install Visual Studio 2015 Update 3 from scratch. You could use that link, but then if you have an MSDN subscription you are better of downloading an offline ISO from there and using that, which is what I did. Initially, I tried in place update of Visual Studio 2015, and the installer kept crashing for some reason (this of-course could be because of the fact that I was on a weak Wi-Fi). The MSDN ISO (a 7 GB download) worked smoothly after an uninstall of my existing visual studio; followed by a fresh install. With Visual Studio 2015 Update 3 (with Core 1) loaded, you’re also going to need Typescript support inside Visual Studio so your Typescript files are compiled and converted to JS files each time you save them. To do that you can grab the Visual Studio Typescript plugin from here and install that. You will also need Node Package Manager (NPM) working on your machine and the simplest way to do that is download and get Node JS installed on your machine. 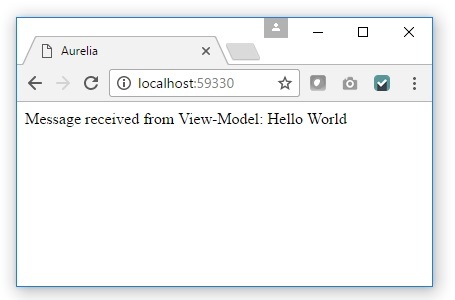 With that done we’re ready to start our first hello world project with Typescript + Aurelia. As I said before, the easiest way to do this would have been to download and use the skeletons, but given that the skeleton’s provided by Aurelia team didn’t work for me; I was left with no option but to build my Aurelia app from hand and get started. Honestly, building your first app by hand actually works out better because it gets you a fresh new insight into many underlying concepts that you will typically not have to pickup if you use a ready made skeleton instead. Since we’re going to be working with Visual Studio 2015 as our IDE of choice, let’s go and create a blank ASP.NET Web Development project inside Visual Studio in a folder of your choice. Open the solution file and keep the solution open in Visual Studio as you proceed with the below. We select the default answer by just hitting enter, except for picking the Transpiler, where we will use TypeScript instead of the default Transpiler JSPM uses (babel). We now need to start writing code for our project. The first thing we do is right click the config.js file in the solution explorer and say “Include in Project”. This is a simple standard index.html file most Aurelia applications will typically need. We are adding two JS files that aurelia needs. The first is system.js and the second is where our configuration is stored (config.js). 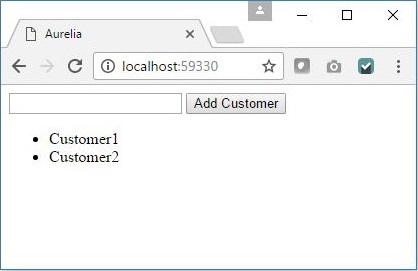 We then use System.import (from system.js) to import the aurelia-bootstrapper. Also note the “aurelia-app” tag in body. A few important pieces are getting connected in the above code and aurelia is using convention to connect the pieces. The index.html tells aurelia to use the config.js file. And as we’ve seen before, the line we added in config.js tells aurelia that the custom aurelia code would be in the “src” folder. The “aurelia-app” tells aurelia to be default look for “app.js” as an entry point. Note: we haven’t specified app.js – but the aureila-app tag itself (by convention) tells aurelia to use app.js by default. You can of-course override the convention but that’s for another post. Right now, let’s just create a app.js in the source folder. Going ahead we will grab out typing files manually so say no to the above for now and let’s proceed. We’re going to talk more about typings later in this post. The binding of the textbox with the CurrentCustomer.CustomerName ensures that the value passes from the view to the view-model. 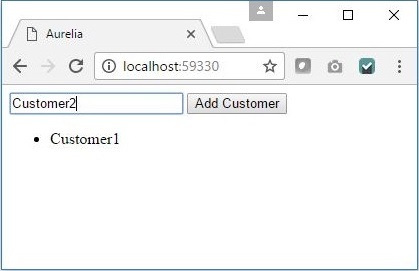 Each Time addCustomer is called, we create a new Customer object and hence the textbox blanks out after the existing customer is added to “Customers” array which is bound to the UL using a “repeat.for” loop. So far so good. Everything we’ve done thus far, compiles, builds and runs. However as you start going into deeper Aurelia, you will realize that you will need to use more complex concepts like Dependency injection (where you would like to inject services into your view-models). The start project we have created works but isn’t fully ready to handle imports because we have the typing files missing. Remember we said we’ll discuss typings later in this post? This is the part where we now need to address typings to move ahead. to change in a future release. The experimentalDecorators value of true ensures decorators like inject are allowed. Exclude on node_modules and jspm_packages ensures that the typescript compiler excludes those when it fires a build. Fire a build now and your build should fire successfully. Run your code and it should just as before because we aren’t doing anything in particular with dependency injection here. 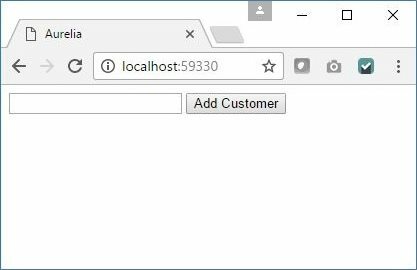 In fact it’s actually a bad example of dependency injection but I included it in this post because the post covers the setup of a starter project that let’s you try out and learn everything that aurelia has to offer while using it with Typescript, inside Visual Studio 2015, so adding a right “tsconfig.json” and getting the typings upfront is a good idea (even if you are not using dependency injection or other advanced aurelia concepts). 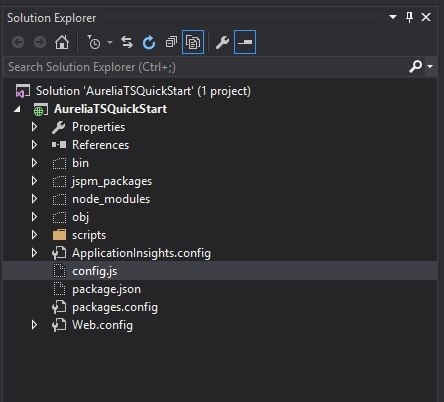 I honestly believe that while the aurelia team is doing an amazing job documentation and videos of aurelia itself, but mixing aurelia with type-script and getting it all to run on visual studio 2015 can turn out to be a bit daunting for someone who is starting out his aurelia + typescript journey because there is no single place to get started. It would be really nice to not have to go through so many steps to just set up a basic development project where you can try out and learn features aurelia (with Typescript) has to offer, while working inside visual studio. I know you can create projects using Aurelia CLI tools but even those had the similar typings related issues that I highlighted in this post. And getting those to work was an equally daunting task. Now that I have been working in aurelia for a few days, I can take a skeleton and make that work too, but as far as I am concerned, the learning curve to get into aurelia itself has been much lower than the learning curve required to get into aurelia with typescript and get it all to work inside visual studio. All I can do is hope that the Aurelia team builds some more documentation around getting started with Aurelia + Typescript. In the meantime, this post you get you on your way. There have been a lot of conversations around IoT lately. As someone who has done his major in accounting and as someone who builds business and financial applications for a living, I had a lot of excitement and some reservations about starting on my IoT journey. I mean I am just a regular nerd without any electronics background. Should I be playing with Microcontrollers and live current? After a few weeks, I’m happy to announce that the journey has been fun and I think it has been a journey worth sharing with you. The basic underlying idea is to control things over the internet and hence the need for a programmable chip or a microcontroller - a small tiny independent board with a programmable chip that can run code in an infinite loop. The code controls the chip and the chip controls the devices or things it is connected to. The “control” in the microcontroller can be as simple as turning a LED on / off or something as complex as building a smart home, with lights, fans, entertainment systems and water pumps controlled using your code. Most articles and you-tube IoT examples out there are either way too complex involving complex circuits and code, or way too simplistic and impractical where someone shows you how to make a LED blink with your code; which fortunately is a good start; but unfortunately does not allow you to anything practical with your microcontroller, which then puts your micro-controller in the same category as your gym membership - something you own but don’t actually use. My goal with this series of posts, is to get started on IoT and provide enough insight on the topic to enable you to build something real and practical with it. The goal is also to take you to a point where IoT goes from yet another buzzword that electronics guys should be concerned about, to a practical, real, affordable and simple tool that you can use to build useful projects with. In the first post we’ll cover some very basic concepts around the Arduino chipset (which is the micro-controller we are going to use for our IoT experiments) and write some basic code that runs on the chipset. In the posts that follow we will attach some interesting modules to Arduino and write code to control these modules. Going ahead, we’ll get these modules and the microcontroller connected to your home Wifi and we’ll show you how you can control the microcontroller (and the modules connected to it) over the internet; and we’ll finally move on to working with real live electrical devices like, light bulbs and fans and control those with code. All circuits we build in the process will be open sourced. All code we write in this process will also be on open sourced and will be posted here on this blog for you to use. When I started with my IoT journey a few weeks ago, I knew nothing about physics (or electronics) other than some basics I had picked up in high school, most of which I had never paid any attention to or had forgotten over time. Long story short, I’m just a regular nerd who writes business applications / CRUD screens for a living and hence the series of these posts doesn’t require you to know physics or electronics to start. You will need to go out and buy a couple of cheap gadgets if you want to try some of these examples yourself but your overall investment will be less than 25 dollars. And as a final disclaimer, I have never officially studied electronics so everything I write about here, is just a regular nerd trying to connect wires and have some fun. If something explodes (or if you cook a chipset or two) the responsibility is all yours! To start playing around with IoT we’re going to write code that controls devices so you’ll have to shell out some money and buy some basic devices. Even though there are platforms like the raspberry pi which make IoT much simpler, let’s start with buying a much cheaper micro controller which actually gets you a deeper understanding of the circuits you will be making, will make a smaller hole in your pocket and will help you stay away from having to run and entire Linux clone on your microprocessor like Raspberry Pi does. 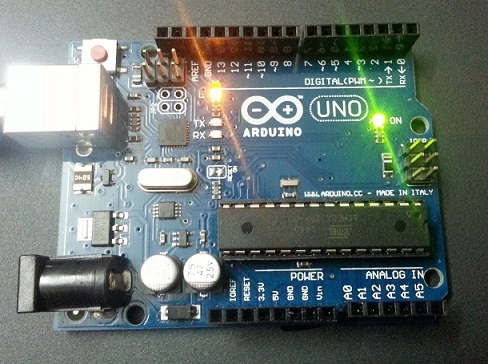 An Arduino UNO chipset - You can buy the original one or a cheap clone. I got one from amazon at about 7$. A Breadboard - so that you can connect wires and devices together without needing soldering equipment. I got mine from amazon at about 2$. Some jumper wires - so that you can connect devices on your Arduino and your breadboard. I picked up a neat set of male-to-male, male-to-female and female-to-female at Amazon. Cost of the whole kit? About 2$. A Few LEDs (and a few resistors) - which is the very first thing we will control with our code. You can also grab some resistors at 150 for just 1$ and a few LEDs for 3$. An ultrasonic transmitter - we will not be using it in the first demo, but we will need this in the third post, so it may be a good idea to get everything you will need in one shot. I picked up mine at 2$. A Wi-Fi module - that will eventually let you get connected to the internet over your home Wi-Fi connection and let you control the Arduino over an internet connection. Price? About 3$. Again, not something we will use in the first post, but something that we will use pretty soon. A Relay - that will let us control real live current / devices using our Arduino - we’re not going to use this for the next couple of posts but at 2$ a piece it’s something you may also want to order along with everything else mentioned above. In under 25$ you have all you need to work on some meaningful IOT experiments and try out a few things. 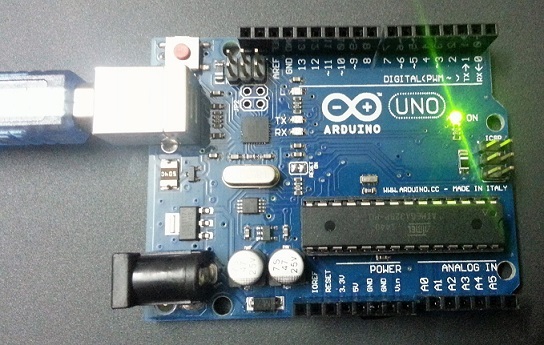 We’ll get started with Arduino itself in this post and make it control a basic on-board LED light before we do some more interesting things with it. I do realize this example is highly non-practical but it is really simple, gets you used to the Arduino IDE and gets you familiar with the environment. So, let’s get started by making a LED blink, but before that lets begin by knowing our Microcontroller. You can read article after after to understand the Arduino, but to start messing around with it, all you need to know is that is has 2 power output pins (using which connected devices can draw power) - one is a 3.3V power output pin, the other a 5V power output pin. Apart from the power pins it also has ground pins labelled “GND” and all circuits that you make will usually end / complete with the ground pin. Put simply, your wiring will start with the power pin and end in the ground pin, and you will control everything else that’s in between (i.e. everything that’s connected to your IO pins). 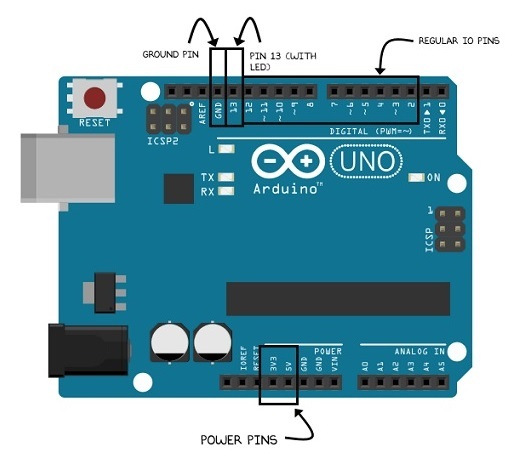 Depending on the device you are connecting to your Arduino you can decide the power output you want to use. Most devices will have specs which will tell you how much power they expect. Exercise some common sense when you pick the power pin - for example, don’t connect your jumper wire to a 5V pin when the device you are connecting expects 3.3V - if you do there is a high chance you will cook your device. Apart from the two power pins there are also some digital pins where you write a high or a low. Think of writing a “high” as turning a switch on and think of writing a “low” signal as turning the switch off. Out of all these pins, pin 13 is special because it has an in-built LED (light) attached to it that you can control with your code. 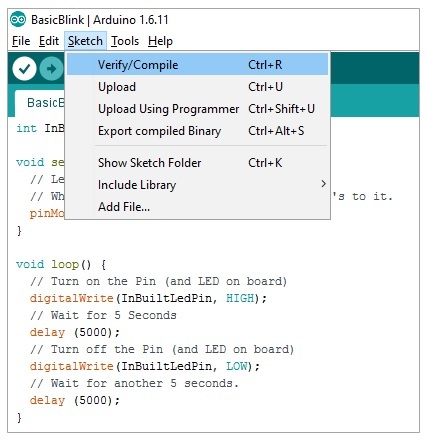 To write code we’re going to get the Arduino studio, which you can download from here and install using a simple installer. 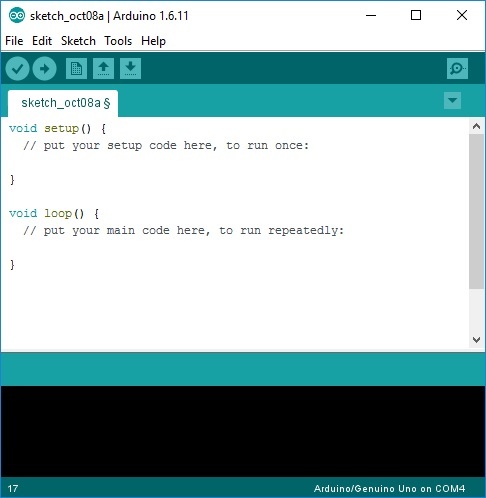 Once done, you connect your Arduino to the USB port of your laptop (which is one of the sources from which Arduino gets it’s power). Of course Arduino itself, can also work without a machine and you can hook it up with a battery or direct power, but for now since we will be uploading our code from our machine to the chip, it makes sense to have it connected with our laptop using the USB port. Once connected go to your Arduino studio and pick the right port your Arduino is connected to. Usually the IDE automatically detects this but if it doesn’t you can try different ports and try to upload your code on each one till it succeeds. All code that typically runs on the microcontroller is referred to as a sketch and each sketch has a loop, which keeps on running as soon as the sketch is uploaded and the microcontroller is powered on. An empty sketch looks like this. Setup function is where you write code that runs only once. Anything you write in in “loop” runs in an infinite loop while the microcontroller is powered and on. // Which means we will write high's and low's to it. // Wait for another 5 seconds. Of course, this will continue in a loop till you switch off the microcontroller by pulling the USB cable off, or till you upload a new sketch. And with that, you have just controlled an onboard LED with your code. In the next post, we will attach an external LED to the Arduino using a breadboard and try and change the same code slightly to make that LED blink. If you’ve never worked on electronics before the next post will introduce you to a lot of basic concepts like breadboards and resistors. And from there we’ll be ready to build some real life projects. So stay tuned for the next post.